There are limitless "styles" of arts. You can speak in terms of "movements" (the Impressionists, for example) or genres (say, folk art) or influences (Picasso and Warhol come to mind, spawning dozens of imitators) or periods ("Modern" art). And each style will have it's own faithful followers and determined detractors. One oft heard criticism is the smug "My 5 year old could draw that!". One thing an art education is good for is teaching, not only to appreciate that art, but to seperate it. Because, some of it, yes, a five year old could draw. But some of it goes far beyond that. In those instances, the artist is choosing to draw in a less realistic style for a purpose--and it lends greater meaning and authenticity to the work. PaintandInk is one of those shops that beautifully showcases how a simple, clean style can add to a work. The Interimaginational Institute of Fantastical Exploration and Cartography (doesn't the name alone make you smile?) creates maps to those hidden, forgotten lands of our childhood. The bright colors and whimsical drawings add to the sense of childhood play, long since buried somewhere in the back of your brain. As a child, I could spend hours with only an unsharpened pencil as a "magic wand" and a friend or two. With our wands, there was nothing we couldn't do, nowhere we couldn't go, nothing we couldn't be. 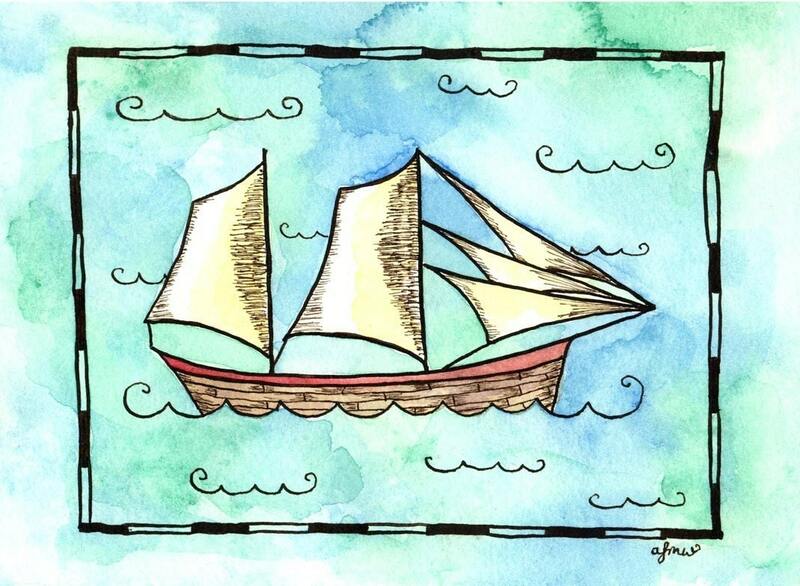 PaintandInk brings me back to that time, that mindset--that sense of adventure and limitless possibility. 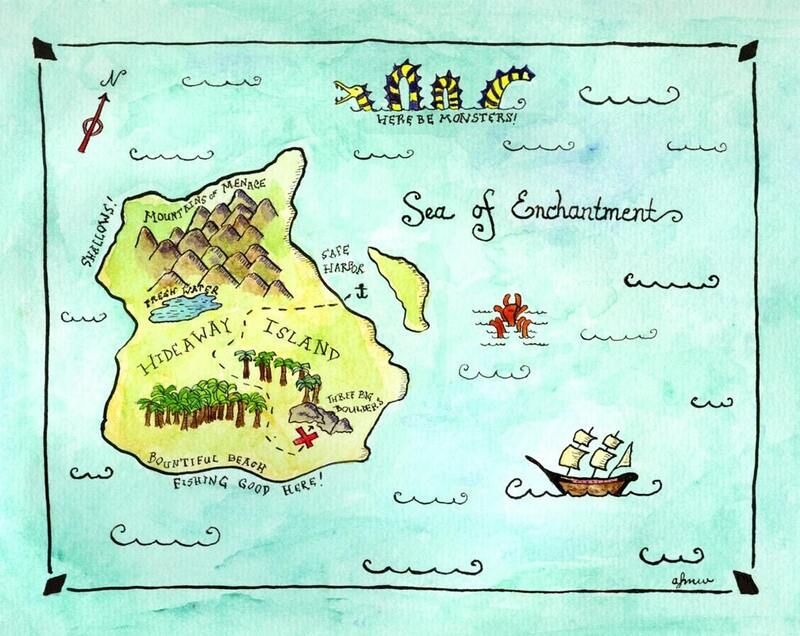 The first image below shows Hideaway Island, just off the Sea of Enchantment. A close look shows how much thought and love goes into each one of the originals. The Mountains of Menance loom to the north, while the "fishing (is) good here" near the "three big boulders" that mark the treasure. The use of watercolors lends a "glow" to the whole thing--mimicking the bright lure of the treasure hunts and limitless adventures of play. The second image showcases the second type of work found in PaintandInk's shop--up close and personal portraits of the characters found in miniature on the maps. If you weren't already convinced, these larger images make it explicitly clear that the straighforward style of work is a choice not a technical limitation. Just look at the rich shading in the sails or the beautiful swirl of colors that make up the sea. The images in PaintandInk's shop are like little portals to days long since gone by. Days where a cardboard box was all I needed to see the world and notebook paper sufficed as a high tech computer. Today, my adventures are a little more costly, the world a bit smaller but these small maps lead me back to those long forgotten adventures. I can envision these maps hanging in nurseries and offices alike. Perfect for anyone with a spirit of adventure, these small prints serve to inspire and illuminate. And that is the real treasure, one you can't put a price tag on. wow... what an amazing seller!